Is it easier to liberalize agriculture via bilateral or multilateral deals? The smartest case for trade bilateralism is that trade in many goods is already fairly free, but some egregious examples of tariffs and trade barriers remain. Look at agriculture, European restrictions on beef hormones in beef, and the Chinese unwillingness to allow in foreign companies. Targeted strategic bargaining, backed by concrete threats emanating from a relatively powerful nation — in this case the U.S. — could demand removal of those restrictions. Furthermore, the negotiating process would be more directly transactional and less cartelized and bureaucratic. The only way concessions can be made on agricultural subsidies is if you go multilateral. Think of production subsidies, which the United States has: they can’t be cut for just one trading partner. When it comes to export subsidies–which are the big issue for the Europeans and a little bit for us too–we will cut export subsidies say, for Brazil, in a bilateral negotiation, but the Europeans won’t. Then the Europeans will have an advantage. My point is that if subsidies are the name of the game in agriculture, if the foreign countries that export want to remove subsidies, they have to go multilateral. This entry was posted in Preferential Trade, WTO Negotiations on 23 June 2018 by jdingel. The Trump administration has certainly increased public discussion of trade policy. Yesterday, the New York Times ran a series of graphics accompanied by a thousand words on “Building Trade Walls” in its online business section. I found the piece frustrating. At a number of points, the article presents valid information in a way that muddles meanings or implies misleading conclusions. Are sales taxes akin to import tariffs? But many countries have additional taxes. For example, China and other countries, but not the United States, also charge a steep value-added tax, which is a kind of national sales tax on imports and home-produced goods alike. Exports are exempt from value-added taxes. 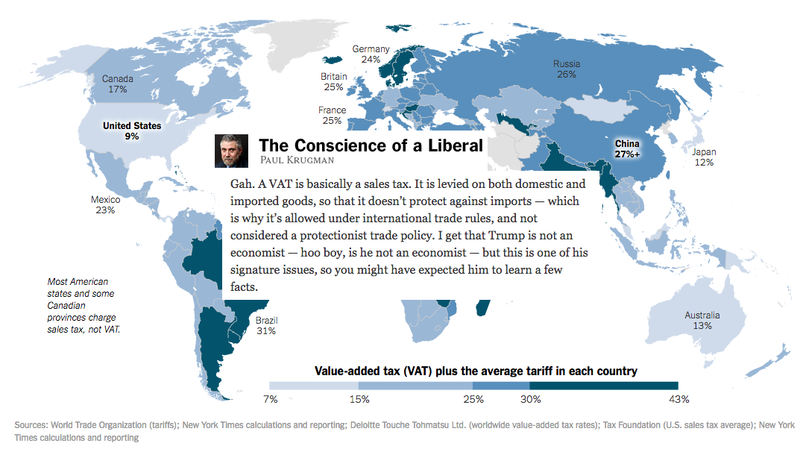 Once value-added taxes and sales taxes are included in an international comparison, America’s taxes on imports are much lower than those of almost every other country. Why would you make an international comparison that counted VATs or sales taxes as taxes on imports? Since VATs and sales taxes apply to both “imports and home-produced goods alike”, they aren’t protectionist. An import tariff applies to imports and not to domestic-produced goods. The discriminatory nature of the import tariff is why it protects domestic firms from foreign competitors. In short, the NYT‘s first paragraph noting the non-discriminatory nature of VATs and sales taxes means that the international comparison offered in the second paragraph is nonsensical. Is China a developing country? Today, China’s designation as a developing country is more debatable. China is the world’s second-largest economy and the biggest producer of steel and cars. Still, China trails most developed nations by some measures, and Chinese officials argue that it is still developing and does not yet qualify as industrialized. China’s economy is still roughly two-thirds the size of the American economy, even though China has four times as many people. Average incomes in China are still one-fifth to one-quarter of levels in the United States, and much of China’s interior is still underdeveloped. Based on the first paragraph, I have to ask: is Iceland a developing economy? It’s quite small, with a GDP of maybe $15 billion. But of course it’s developed, as it has a GDP per capita in the neighborhood of $50,000. Development is about income levels (and accompanying socioeconomic changes), not population size. I have never before seen GDP (as opposed to GDP per capita) used to inform the “developing country” designation. The World Trade Organization, the global trade adjudicator, has allowed developing countries to impose far higher tariffs than industrialized countries, while they build up industries at home. China has been counted as a developing country. This is unhelpful in a few important respects. First, the WTO does not designate countries as developing or developed. In the narrow areas where developing countries are given special and differential treatment, member nations identify themselves as developing. Second, the “global trade adjudicator” language is potentially confusing. Countries’ MFN tariff schedules are negotiated among member nations at the WTO. There’s no separate WTO entity announcing tariff rates for developing (or developed) countries. Past rounds of negotiations among members have resulted in the tariff schedules of China and other economies. Third, China has lower tariff bindings than a typical developing country, partly because it acceded to the WTO later than most developing countries. Branstetter and Lardy say that “China agreed to a set of conditions that were far more stringent than the terms under which other developing countries had acceded”. Compare China’s 10% average bound tariff to Brazil’s 31% or India’s 49%. Fourth, there is not much evidence that “far higher tariffs” have allowed countries to “build up industries at home”. China’s export growth, in particular, has involved integration into global value chains and assembly processing, not import-substitution industrialization behind a tariff wall. It would be more helpful to plot the trade deficit as a percent of GDP than in nominal dollars. A focus on the bilateral deficit with China is unhelpful. A discussion of border adjustments that does not mention exchange rates omits a first-order feature, according to the policy’s proponents. The NYT reporters say: “When China joined the W.T.O. 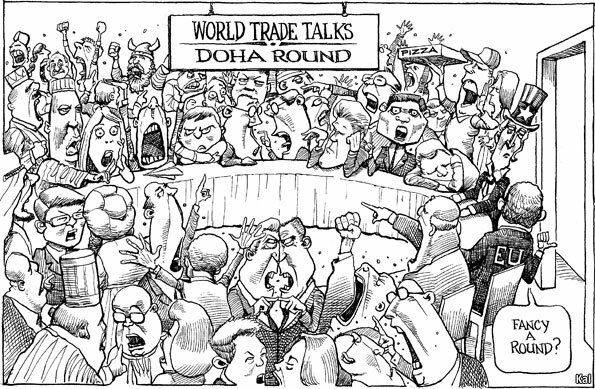 in 2001, the expectation was that its tariffs would later be adjusted lower during global trade talks, known as the Doha Round. But those talks fell apart for a variety of reasons.” China’s bilateral negotiations with the US wrapped up in 1999. The protests in Seattle that year accompanied a failed round of WTO negotiations. I don’t think expectations of the Doha Round – which started two years later in a post-9/11 context – were clear when China’s accession protocol was being determined. This entry was posted in Politics, Protectionism, WTO Negotiations on 8 March 2017 by jdingel. This entry was posted in WTO Negotiations on 13 December 2011 by jdingel. Also on Doha, don’t miss this Alan Beattie tweet. This entry was posted in WTO Negotiations on 5 December 2011 by jdingel. Does the DSM need support from ongoing negotiations? This entry was posted in WTO, WTO Negotiations on 20 October 2011 by jdingel. open trade system, it will have a stake in preserving it. A concrete way to realize this is to move beyond the Doha Round to start a new round of multilateral trade negotiations — a possible “China Round” — that would focus on the issues — exchange rates, government procurement, services, technology policy, commodities, and climate change — which are particularly crucial for China’s trade relations with the US and with other large trading nations. In your book, you talk about the importance of tethering China to a multilateral system. Why should China be interested if it’s inevitably number one? Everyone has to come together to do this well. If every country tries to make its own deal with China, no one will have any leverage. Think about exchange rates. If the world came together now and said let’s do a deal on exchange rates, China would be more likely to participate. It doesn’t want to be seen as deviant from international system. The opprobrium of the world is the biggest carrot and stick to use with China. One of your main policy recommendations is to start a China round of trade negotiations. What could that accomplish? When China joined World Trade Organization in 2001, people said we tied China to the global economic system (because of the commitments it made to open its markets and follow international rules). But through its exchange rate policy, China has unraveled parts of its commitments. What that signifies is that Chinese leaders at the time were overreaching in terms of domestic political support. Evidently, WTO accession wasn’t politically sustainable internally. Over time, China will move away from mercantilism. They would then have an incentive to make a deal. A deal could involve government procurement – other countries opening their bidding for China—as well as commitments by China involving control of natural resources and the exchange rate. This entry was posted in WTO Negotiations on 4 October 2011 by jdingel.